In the wake of the passage of a new law legalizing abortion up until the point of birth in New York state, one bookstore owner has closed his shop to send a message to Democratic legislators and Gov. Andrew Cuomo (D). 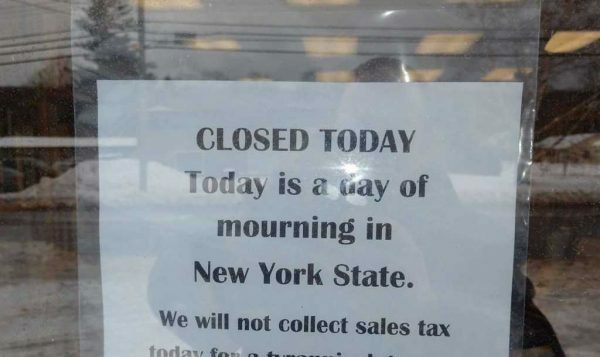 Jon Speed, owner of The Book Scout in Syracuse, announced Wednesday he has shuttered his bookstore for the day to mark “a day of mourning in New York” following the passage of the radical bill signed into law Tuesday night by Cuomo. Speaking of the law itself, known as the Reproductive Health Act, Speed said it essentially nullifies the Clinton-era standard of “safe, legal and rare” because abortion is “certainly not going to be rare” in the liberal state moving forward. But closing the bookstore, he said, was not a publicity stunt. The small business owner closed his shop in hopes of sending a message directly to his state legislators and to the governor, a small protest that will keep taxpayer dollars from going to the state government for at least one day. Speed said his bold move against the state’s new legislation has received a mixed reception. In Syracuse, he told Faithwire, people are “ticked off” by the day-long closure. But online, Speed revealed, he’s received a “huge response” from pro-lifers around the country.